The areas of discussion will be on: ‘The World of Analytics’, ‘Bridging Talent in Analytics’, ‘Next Big Technology in Analytics’ and ‘Building an Analytics Team’. The event will be followed by networking, cocktails and dinner. The panel includes senior Analytics professionals such as Mr. Akash Bhatia, Mr. Amit Khanna, Ms. Iqbal Kaur, Mr. Lalit Ahuja and Mr. Sujoy Bhattacharya. The event is expected to be attended by senior HR and Business representatives from leading Technology, Finance & eCommerce and Boutique Analytics firms. 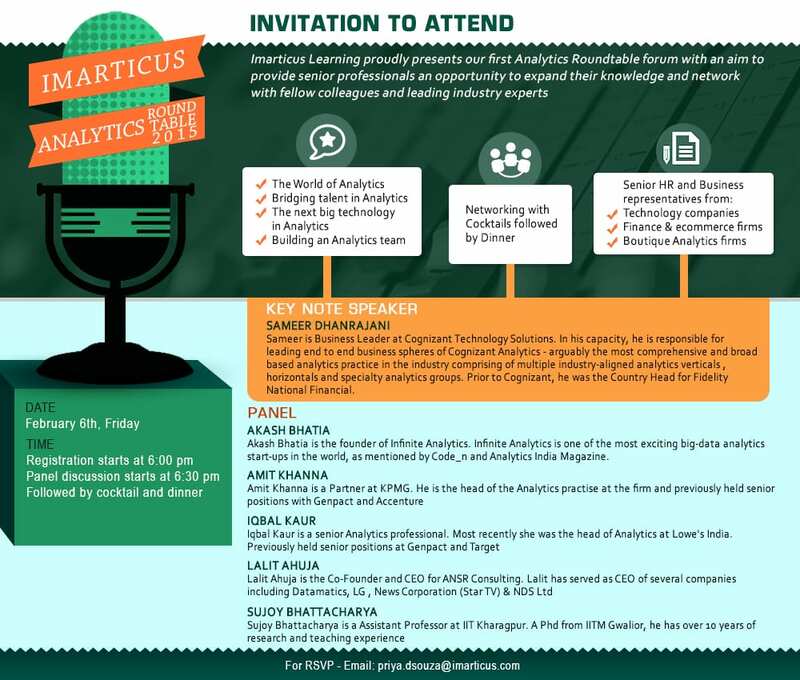 Interested individuals in the Analytics domain can reach out to priya.dsouza@imarticus.com for more information. Media coverage requests: Please reach out to sohail.merchant@imarticus.com.